As I said in last week's healthy, sustainable seafood article, I grew up on Cape Cod, yet never liked the taste of fish. Of course, I didn't like the taste of much back then, aside from wheat and sugar. Now that both of those are out of my diet, my tastebuds have expanded exponentially. I look at food differently now. I still want it to taste good, but since food is my medicine, it needs to be nutrient-dense as well. 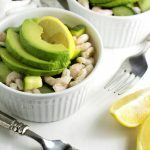 My research on seafood convinced me that it plays an important role in a healing diet. So, to truly challenge myself, I signed up for a seafood CSA, where I'll be forced to try new varieties regularly. We had our first delivery this week, which included flounder and mackerel. I froze the flounder and started searching for recipes for mackerel. 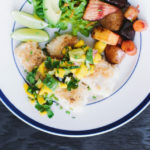 It's one of the top 5 healthiest and most sustainable seafood choices. A three-ounce portion contains over 2500 mg of omega 3 fatty acids and 300 IU of Vitamin D. In addition, it's one of the most plentiful fish in the ocean and much less expensive than its healthy compatriot, salmon. However, it also has a reputation for having a strong “fishy” flavor, and that made me nervous. I was lucky enough to have fresh mackerel, caught just two days prior. It had no fishy scent, which is a good sign. I chose a recipe by Mark Bittman as inspiration. He suggested simmering the mackerel in a soy-based sauce and serving it over white rice. 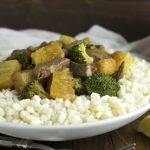 I paleofied the recipe, replacing the soy with coconut aminos, and the rice with cauli-rice. The result? It was one of the most delicious things I've ever tasted. I also think this sauce would accentuate any meat or vegetable stir fry. I'm going to start calling it “magic sauce”. I loved this recipe so much, I'm hoping for more mackerel in future fish deliveries. Update 3/24/14: If you don't have access to fresh mackerel, I tested this recipe with salmon and it's absolutely delicious. This is amazing, because I've prepared salmon countless ways and never liked it until today. 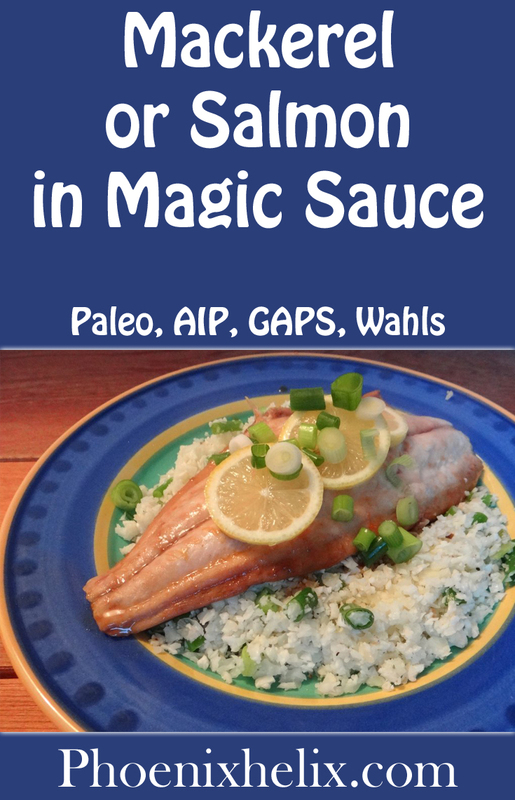 My husband, who loves salmon, was worried the sauce would be too strong, but he ended up loving this recipe, too. A recipe that pleases both fish lovers and haters? That is magic! Lightly salt the flesh side of fish fillets and set aside. Add coconut aminos, sherry, water, honey, white wine vinegar, ginger slices, lemon zest, and crushed garlic to a large skillet. Don't turn on the heat yet. Cut cauliflower into small florets and pulse in food processor until it reaches rice consistency. Set aside. Slice the scallions, putting white slices in one small bowl and green slices in another. Slice the lemon into thin slices and set aside. Make the cauliflower rice: Melt coconut oil in a large soup pot over medium heat. Add white parts of scallions and sauté 3 minutes. Add the cauliflower rice and salt, and toss to blend. Let it cook 5 minutes, then use a spatula to turn the rice over. It’s easiest to turn the rice if you scoop from the center outward. Let it cook another 5 minutes. Remove from heat. Add the green parts of scallions, more salt, and toss to blend again. Let some of the steam release from the pot, and then loosely cover, to keep warm while the fish cooks. Now, bring the sauce in the skillet to a boil, then reduce to simmer over medium heat for 5 minutes, uncovered. Add the fish, skin-side down and swirl the pan so the sauce flows over the top of the fish. Simmer uncovered for 7 minutes. Then cover pan and cook 3-5 minutes more, until fish is cooked through. It will be warm in the center, and flake when tested with a fork. 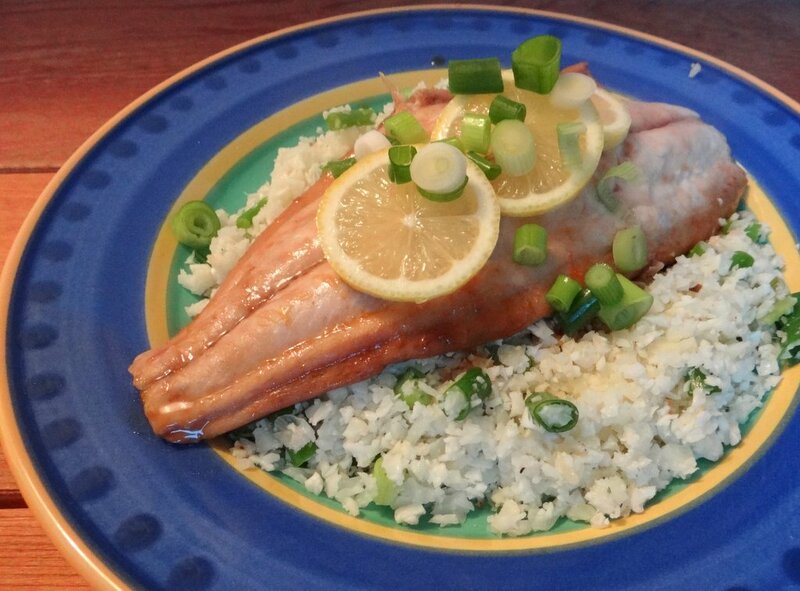 Serve the fish on top of the cauliflower rice. Remove the ginger and garlic from the sauce, and pour the extra sauce on top of the fish. Then garnish with lemon slices. After researching my seafood article, I learned that overfishing, questionable farming, and rampant seafood fraud makes it very difficult to find seafood that supports our health. For that reason, I became an affiliate of the online company Vital Choice. They do the research for you, offering only a small selection of sustainable seafood, from fisherman they know and trust, that are all healthy choices. If you don't have access to a local seafood CSA, I highly recommend them. Added bonus? 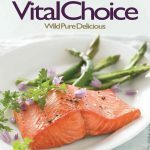 Vital Choice is offering a 10% first-time customer discount to Phoenix Helix readers. Just enter the code VCAFINT during checkout.